This B&H Kit of Canon VIXIA HF G50 4K Camcorder Kit with Epiphan Webcaster X2 is assembled to provide you with a UHD 4K camcorder and webcaster for live streaming to YouTube Live or Facebook Live. The camera's HDMI output is a perfect match for the HDMI input on the Webcaster X2, which allows you to stream via a Wi-Fi network or over you LAN. The VIXIA HF G50 features a 29.3 to 627mm zoom lens for getting close to your subjects, and incorporates 5-axis image stabilization. Supporting 3840 x 2160p30 and 1080p60, the VIXIA provides sharp, clear images and even supports 24p to bring a cinematic look to your videos. Expanding the streaming abilities of the previous generation X1 boxes, the Epiphan Webcaster X2 can broadcast to either YouTube Live or Facebook Live. 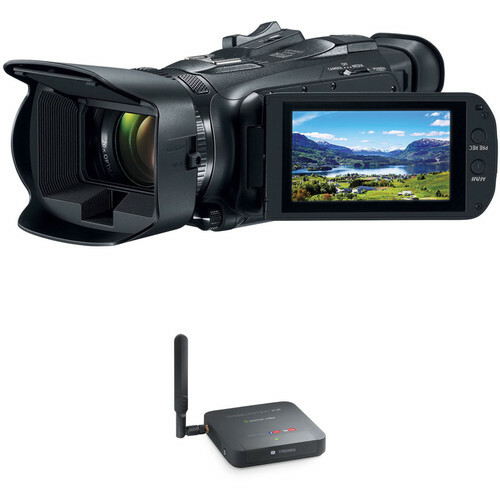 Plug in your camera, switcher, or other HD video source via HDMI, connect to a local area network via Wi-Fi or hardwired Ethernet, and set up your stream by pairing the device to your relevant streaming accounts. The front display shows streaming status and pairing codes for setup. For additional tweaking, plug the HDMI output into a monitor and connect a separately available mouse or keyboard to the onboard USB ports. To keep things easy, the Webcaster X2 will automatically configure the H.264 encoding bit-rate for optimal performance based on the streaming platform and output resolution. Monitor your live video and see viewer comments and reactions in real time. Simply connect a display to the Webcaster X2's HDMI out port. Webcaster X2 streams your live video to your choice of Facebook Live or YouTube Live. Switching between them is simple, and Webcaster X2 remembers all your settings for both YouTube and Facebook Live. Choose to stream to your Facebook Timeline or any Group, Event or Page you administer. On YouTube, choose to stream live now, or publish to a scheduled event. Connect a mouse and monitor to Webcaster X2 using the onboard I/O for additional configuration options and greater control. Set up is easy with a simple device code to pair it to your accounts, the rest is done for you—the device comes pre-configured with optimal H.264 encoding settings for YouTube and Facebook Live streaming. Pick from Facebook destinations like your Timeline, Events, Groups, and Pages, or from YouTube Stream Now and scheduled events. When 4K UHD/IS set to ON and Standard IS set to ON, the range is 29.3 to 627mm. With IS set to OFF and Standard set to ON, the range is 30.5-627mm. Box Dimensions (LxWxH) 10.7 x 7.9 x 7.5"
Box Dimensions (LxWxH) 6.45 x 5.9 x 3.45"
Vixia HF G50 UHD 4K Camcorder (Black) is rated 4.0 out of 5 by 1. Rated 4 out of 5 by Noah Fabry from Unexpected When I got the camera I only got it for my family vacation to hawaii, but it turns ou that this camera unlike a reagular handycam shoots the best quality I have seen from a camcoreder. What is the censor size? The Vixia HF G50 has a 1/2.3-inch 4K UHD CMOS sensor. Would this work well to livestream a worship service? Yes, this camera has a clean HDMI out which will work perfectly with live streaming. Will this record to mp4 files larger than 4GB? While the exact size of the files recorded is not listed, this camcorder will break up the clips within the Memory Card. However if you follow proper workflow and keep the file structure intact, when you import the footage in to an editing system the video will appear as one complete clip. Proper workflow means that if you copy the footage from your SD card to the computer you must copy and paste the entire contents of the memory card, which includes meta data, and from there important it in to your NLE. Does it have a LANC input? A LANC port is present on the camera. Is there an input for external mic? Yes there is. This camcorder has a 3.5mm diameter stereo mini-jack input for external microphones. The camcorder would be 1.9 LBS. What is the bit rate for UHD 4K? This camcorder records UHD 4K at 150 Mbps. What's the aperture of the lens? The G50 has a Max Aperture between f/1.8&ndash;2.8. With F/1.8 being at its widest, it will ramp down as you zoom in.